There were only 18 Celtic coins on offer, estimated at 20,000 euros. The selling price rose to almost 32,000 euros – nothing exorbitant but quite satisfying, which proves that Celtic coins of superb quality find their admirers. That was characteristic for the auction and goes for the “Greek” section, too. Let’s look at one example: a simple tetradrachm from Athens, of fine albeit not rare style, well centered and on an unusually large planchet, sharply minted. This showpiece rose to an end result of 12,650 euros on its pre-sale estimate of 5,000 euros. Even more expensive, proportionally, was a diobol from Kebren, which seemed rather normal until it was looked at with a magnifier. Its estimate read 500 euros. Its new owner was willing to pay 5,750 euros for it. And here is a third example testifying to what makes the heart of the coin collector beat faster at the moment. Two coins from Lycia experienced a high flight: a stater of dynast Kuprilli with its impressive head of Zeus in the best state of preservation left its (admittedly rather modest) estimate of 2,500 euros far behind and reached 19,550 euros; a stater of Teththiveibi, starting with the estimate of 2,000 euros, obtained the same result. Lot 224. Greeks / Attica. ATHENS. 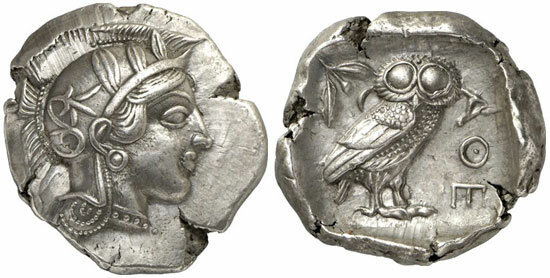 Tetradrachm, after 449 B. C. Starr pl. 22f. Extremely fine. Estimate: 5,000 euros. End result: 12,650 euros. But it was Rome where the real surprises came up. All aurei, given they were extremely fine, were sold at prices much higher than the quite realistic estimates. That could be seen with the Republican coins already. The first aureus of Caesar showing a Victoria on its obverse and a wreath with COS QVINC on its reverse was a bit weakly struck but extremely fine and very rare. It had been estimated at 6,500 euros but yielded 14,950 euros in the end. Even higher was the result of an aureus featuring the portraits of Marc Antony and Octavian (estimate: 20,000 euros / end result: 32,200 euros). The aureus of Octavian from Brindisi, likewise estimated at 20,000 euros, even fetched an end result of 57,500 euros – it is hard to tell whether it was thanks to its enchanting reverse or its provenance from a Kricheldorf auction from 1969. Naturally, denarii and bronze coins of outstanding quality obtained magnificent prices. To give but one example: We presented an as of Galba in our auction preview, regardless of its quite low estimate of 1,500 euros, because of its untouched beauty. The coveted piece cost more than 12,000 euros in the end – and this was more than justified. Let’s conclude the first sale’s review with some more testimonies to the current gold rush – except for the last piece, they are all aurei: Otho (50,000 / 80.500 euros), Lucilla (7,500 / 21,850 euros), Septimius Severus (15,000 / 80,500 euros), Probus (10,000 / 29,900 euros), Diocletian (15,000 / 52,900 euros) and a solidus of Crispus (15,000 / 29,900 euros). 547. Roman Imperial Times. AUGUSTUS, 27 B. C. – A. D. 14. Aureus, 29-17, Brindisi(?). RIC 268. From Kricheldorf 8 (1969), 198. Extremely fine to mint state. Estimate: 20,000 euros. End result: 57,500 euros. Ancient coins and multiple lots are next – and this is a clear indication of how healthy the market is at times present. The remarkable number of 1,826 out of 2,487 pieces was sold, at a total price of 630,000 euros. Actually, on a lower level, there were extraordinary results here, too. A connoisseur recognized the outstanding rarity of an obol from Koressos with its seemingly primitive die cutting. The very fine object was estimated at 200 euros. 1,500 euros was the price its proud new owner was inclined to pay. The unchallenged high-flyer became a tetradrachm from Syracuse, whose die had been cut by the ‘Master of the Large Arethusa Heads’. The attractive lot in good very fine was called out with an estimate of 800 euros. The end result was more than ten times that sum, i.e. 12,650 euros. Lot 1172. Greeks / Sicily. SYRACUSE. 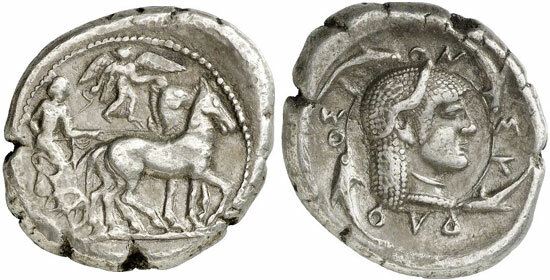 Tetradrachm, 510-485. Boehringer 46. By Master of the Large Arethusa Heads. Good very fine. Estimate: 1,000 euros. End result: 12,650 euros. And, as a matter of fact, the multiple lots again attracted many keen bidders. The total estimate read 62,000 euros; at the end of the day, the 116 lots obtained 72,000 euros. And this takes us right to the coins of medieval and modern times. The first part of the auction sale consisted of an impressive collection of medals. The most outstanding piece, a Trinity medallion from 1544 by Hans Reinhard the Elder, yielded just the humble sum of 27,600 euros, regardless of its perfect provenance and condition. We can only congratulate the bidder on this lucky acquisition. Other medals surpassed all expectations, like a medal 1631 of J. von Loof on the victory of the United Provinces over the Royal Spanish fleet (1,000 / 4,140 euros), the medal of the same die cutter on the capture of the city of Hulst in 1645 (6,000 / 11,500 euros), the medal of Dadler on the wedding of Prince Wilhelm (3,500 / 8,050 euros) or the medal 1731 on the 500th anniversary of the foundation of Danzig (750 / 3,450 euros). Almost 15,000 euros – that was the price the Prussian reichsthaler of 1705 with SVVM CVIQVE, the motto of Frederick I, was sold for, a price far higher than the pre-sale estimate of 10,000 euros. The German section witnessed pleasing results as well, like a surprise from Bavaria: an inconspicuous Madonnenthaler of Maximilian I from 1624 brought seven times its estimate of 250 euros, hence 1,725 euros. The next lot, a 5 ducat piece 1640 on the refortification of the city of Munich rose on its estimate of 3,000 euros to 12,650 euros. Likewise remarkable were the hammer prices for gold coins dating to the German Empire. Rarities continue to be highly coveted and enthusiastically bid for. 20 mark 1905 A from Mecklenburg-Strelitz in extremely fine to mint state with a mintage of only 1,000 pieces had been estimated at 7,000 euros. To its new owner it was worth 11,500 euros. A very fine 20 mark 1874 B from Schaumburg-Lippe, likewise rare with a number of 3,000 specimens minted, obtained 6,325 euros on a pre-sale estimate of 3,000 euros. Lot 4592. Italy / Venice. MARINO FALIERO, 1354-1355. Ducat n. y. Paol. 30-1. Slightly bent. Extremely fine. Estimate: 3,000 euros. End result: 23,000 euros. 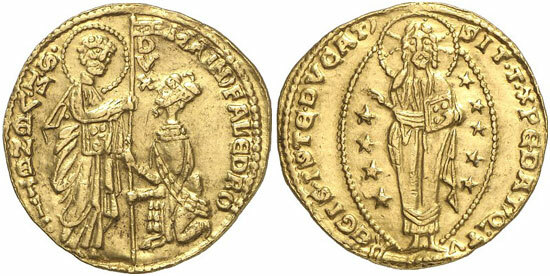 The sale’s greatest surprise was a ducat of the Venetian doge Marino Faliero. The piece is of high historical importance. Marino Faliero was the one doge who dared to stage a coup. We cannot say what his motives were for all records had been burnt after the secret proceeding. Anyway, the man was decapitated on April 17, 1355, on the very same staircase he had been granted the Cornu Ducale just half a year before. It comes as no surprise, therefore, that during such short a reign only a small number of ducats were minted. 23,000 euros were achieved by the piece that had carried a pre-sale price tag of 3,000 euros. Lot 5132. Russia. NICHOLAS II, 1894-1917. 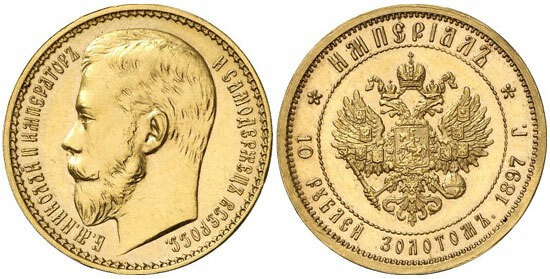 Imperial – 10 rouble gold 1897, St. Petersburg Mint. Bitkin 319. Ex WCN A 46 (6/2011), 1100. Of utmost scarcity. About mint state. Estimate: 100,000 euros. End result: 172,500 euros. Finally, let’s have a look at Russia. Here, some impressive results were to be witnessed, too, like the one for a School Prize Medal of Paul I, awarded in 1887 (15,000 / 40,250 euros). The most expensive coin of the entire auction became an imperial, a 10 roubel gold coin from 1897 of utmost rarity, minted most probably in a tiny mintage as a donative. The almost mint state specimen had been estimated at 100,000 euros and was sold for 172,500 euros in the end. Actually, chances had been very high for another piece to become the top-seller. A hitherto unedited rouble of Paul I from 1798, unique in all probability and of high numismatic importance, had been estimated at 200,000 euros. There was much interest in this rarity. Many collectors and dealers alike had come to inspect it firsthand. In the end, however, too many questions (exact reason for its minting, the coin’s way until the auction etc.) remained open. They couldn’t be answered with the data currently available. Consequently, many potential buyers abstained from bidding until new information will shed light on the background of the coin. All prices include 15 % buyer’s premium. Full results can be viewed on the internet at https://www.gmcoinart.de/kataloge. Post-auction sales with Gorny & Mosch, Giessener Münzhandlung, Maximiliansplatz 20, D-80333 Munich, phone +49 / (0)89 / 24 22 643-0, fax +49 / (0)89 / 22 85 513. Consignments for the upcoming October auction 2013 are accepted as of now until August 2, 2013.